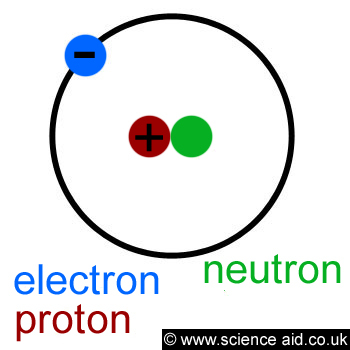 The red and green circles in the centre are the proton and neutron, they both make up the nucleus. The blue circle is the electron and the black ring shows its orbit around the nucleus. Mass number - This basically tells you the number of particles in the nucleus (as the electron has negligible mass). These numbers, along with the element symbol are often written together as follows. The top number is the mass number and the bottom is the atomic/proton number. If you want to work out the number of neutrons you simply subtract the bottom from the top, leaving you with 30. An isotope is merely where you have different chemicals of the same element, but have different numbers of neutrons. ie. the atomic numbers are the same, but the mass numbers are not. On the periodic table, the relative atomic mass is given, this can be thought of as the average mass of the atoms. The example below shows how to calculate this given the relevant data.